In a Proof of Stake system, the odds of a miner creating the next block are proportional to the stake of coins they hold. It’s a far more energy-efficient approach than the Proof of Work approach that bitcoin pioneered. Bitcoin solved a problem that many experts believed did not have a solution. Since data can be copied so easily, how can money be sent directly from one person to another online without worrying that the sender used the same funds more than once? This apparent dealbreaker, known as the Double Spend Problem, is why traditional payment systems have a trusted intermediary like a bank to keep accounts for everyone. Satoshi Nakamoto, Bitcoin’s anonymous creator, realised that one way to do away with a single, trusted authority was to share accounts publicly with everyone. Users submit transactions to the network, and the nodes or ‘miners’ that maintain the shared ledger all compete to be the one to add recent transactions to the next block. This competition is computationally hard, and a huge amount of collective processing power underpins the bitcoin network — along with significant hardware and energy costs. The competition is organised so that an answer is found roughly every ten minutes. When a miner finds the answer, a new block of transactions is created and linked (‘chained’) to the previous block to create a continuous record. The winning miner is sent a tranche of new bitcoins, plus all the fees from the transactions in that block, as a reward for their work in processing transactions and keeping the network secure. Meanwhile, the entire network checks the blockchain to make sure all of the transactions in the blocks make sense and add up. Once a transaction has been included in the blockchain and a number of new blocks have been added on top of it (typically three to six), it is considered legitimate and fully confirmed — part of the permanent and tamper-proof record. What this means is that it would take a huge amount of processing power to submit a fraudulent transaction, because the rogue miner would be competing against the rest of the network to add it to a new block. They would then have to add not just that block, but several other blocks in a row on top of it, to ensure the bad transaction was fully confirmed without the next miner and the rest of the network discarding it. In practice, it is far more lucrative for a miner to work with the rest of the network and receive the rewards than to waste time and energy trying to submit a transaction that everyone else will simply ignore. Satoshi Nakamoto’s Proof of Work system enabled peer-to-peer online transactions for the first time ever, but it is not a particularly efficient way of going about establishing network consensus (that is, ensuring that the majority of the network agrees on the content of the ledger). The problem is that bitcoin and crypto mining, just like its real-world analogue, is energy intensive. It takes a lot of power to find what you’re looking for. This is also why bitcoin is an inflationary system: new block rewards are required to reimburse miners for their considerable costs. Although in theory anyone can participate in bitcoin mining, in practice the overheads make profitable mining relatively exclusive. An increasingly popular alternative is Proof of Stake (PoS). Instead of holding a work-based competition to decide who will create the next block, in PoS systems the ‘miner’ is chosen at random from available network nodes, with their chances of winning being proportional to the amount of coins they hold. Whilst Proof of Work (PoW) is like digging for buried treasure, then, PoS is more like a lottery — the more tickets you have, the better your odds, rather than the harder you dig. Aside from being far more energy efficient, this also has the effect of aligning incentives between those who hold coins and those who maintain the network. Bitcoin and other PoW cryptocurrencies do not feature this alignment — there is no intrinsic reason for miners to hold their bitcoins. 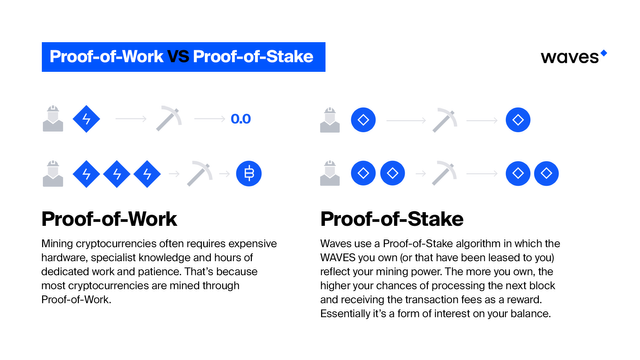 For example, take Waves, a blockchain platform that uses a variation on Proof of Stake mining. 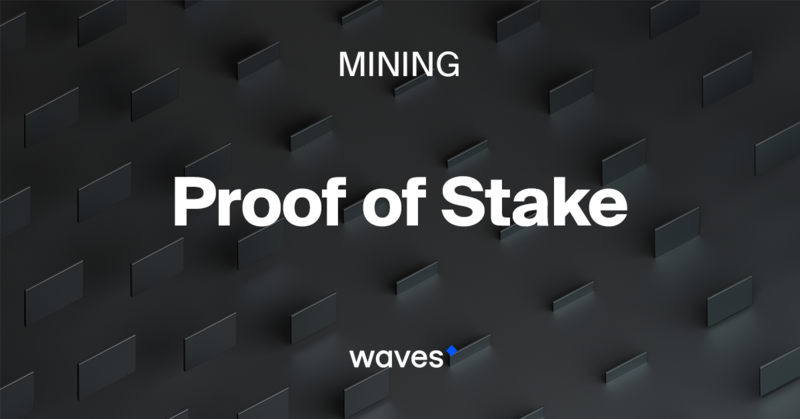 There are 100 million WAVES tokens, and so 100 million potential chances to mine the next block. A miner who has a balance of 1 million WAVES will have a 100 times greater chance of mining a block than one who has 10,000 WAVES. Because there are very low costs involved — a simple hosted server is all that is required to mine on Waves — there is no need to incentivise miners with new block rewards and Waves can have a static coin supply. As well as being more efficient by nature, PoS can also form the foundations of a faster system. Waves has built on the concept to create a consensus algorithm capable of supporting up to a hundred transactions per second, making it suitable for mass-market applications. Proof of Work and Proof of Stake are the two most common blockchain consensus approaches. Others exist but have not had the level of academic research or real-world testing as these. While PoS and delegated PoS certainly have advantages, they are fundamentally much less secure from attack. Nice explanation. What happens if someone stakes 50% off all thrown out coins, isn't that an issue at all?! Someone would have to gather 50% of all the coins first, assuming coins were fairly and broadly distributed this could be very hard to do. As you buy more coins, the price increases, the more you buy the more extreme the price increases become. I worked it out once, to buy a 50% of Bitcoin supply (imagine it was a PoS coin) would cost far more than buying mining equipment for 51% of the hashing power. Also in PoS once coins are used to stake they are unable to stake another block for an amount of time (they become locked) so you would have to split the coins into many addresses probably hundreds to be able to do the attack. That also means the rewards are locked for hundreds of transactions, which makes it nearly impossible to create a fork and spend the funds before the network responds. SolarCoin, Gridcoin and Pinkcoin are wirth a look if you are interested in PoS. You got a 21.43% upvote from @upmewhale courtesy of @wavesplatform!